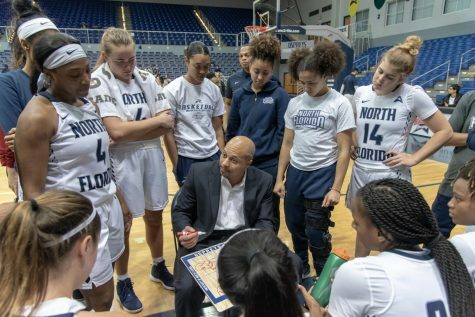 Hot shooting from the Lions hindered the Ospreys from grabbing the win in game one of the UNF Basketball doubleheader. Redshirt-Sophomore Jazz Bond got UNF on the board early with a mid-range shot to start the game on the right foot. The Lions began a 6-0 run to fuel a lead that they would never relinquish. 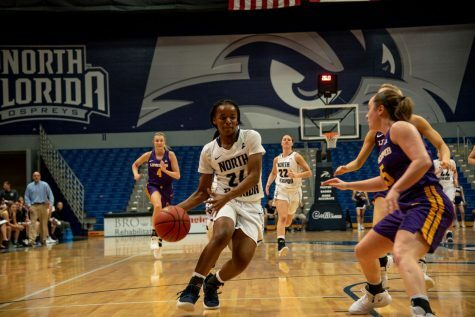 Junior Adrienne Jackson hit a three-pointer to put the Ospreys within three, 8-5 Lions, but Junior Ivy Wallen was controlling the floor as she recorded five assists in the first quarter to set UNA up with a 17-12 lead to finish the first quarter. 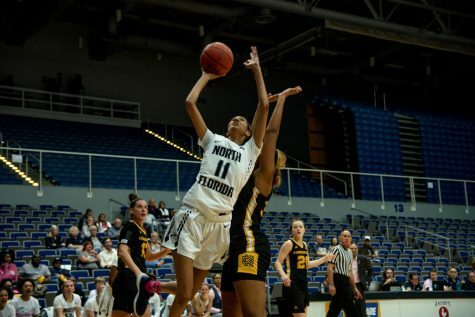 The Lions shot 50 percent from the floor as UNF shot 33 percent. The Lions hit the ground running in the second quarter as they grabbed a lead as large as 11 points (34-23) midway through. 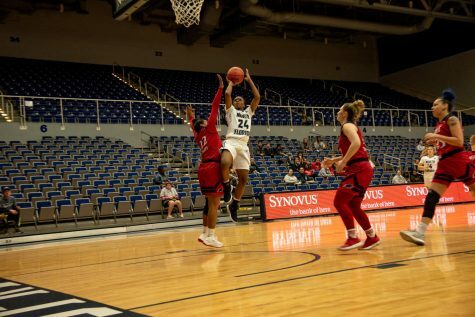 The Ospreys finished the second quarter strong as they had a 7-1 run going into halftime, but the Lions still led, 35-27. Bond led the Ospreys with 12 points in the first half while Wallen scored 11 with eight assists for the Lions. 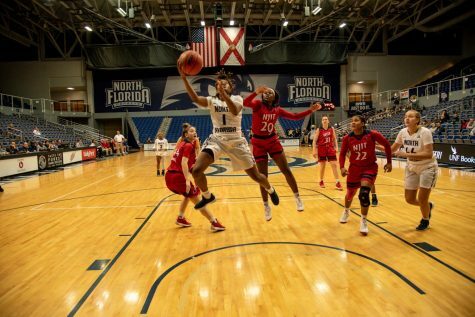 As the third quarter began, a 6-0 run sparked a comeback for the Ospreys as they were only down 38-34 to the Lions but UNA hushed them with continuous made shots. The Ospreys stayed within 10 of the Lions at the end of the third quarter, 57-47 UNA. 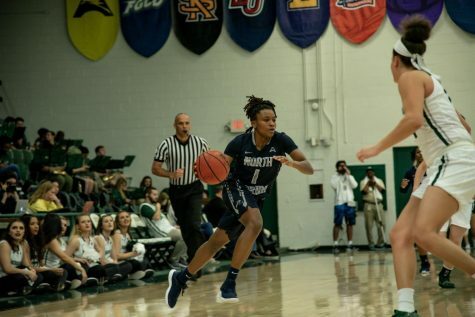 Jackson made a key layup as the Ospreys were within six of the Lions with five minutes left in the fourth quarter, 59-53 Lions. Senior Savannah Stults nailed a three-point dagger to bury the Ospreys as the Lions led, 68-58 with 2:45 left in the game. The Ospreys eventually lost, 77-62 to the UNA Lions. Bond finished with 23 points and 12 rebounds (her fifth double-double of the season) and Wallen recorded 31 points with 10 assists to fuel the Lions in the win. 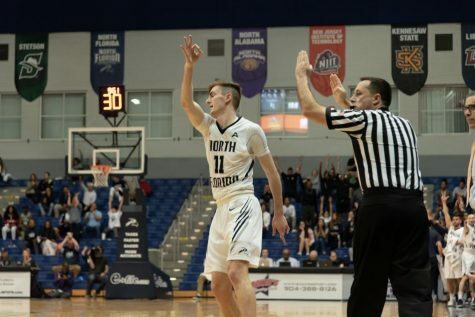 With the loss, UNF drops to 9-12 (4-6 ASUN) and UNA improves to 17-3 (8-2 ASUN). 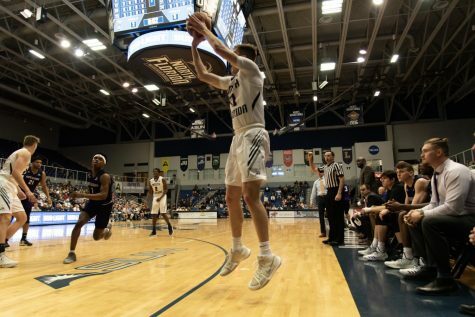 The Ospreys head home to take on Kennesaw State on Tuesday, Feb. 12 at 7 p.m.
After losing six straight games, the Ospreys snapped their streak by beating UNA to get back on track. 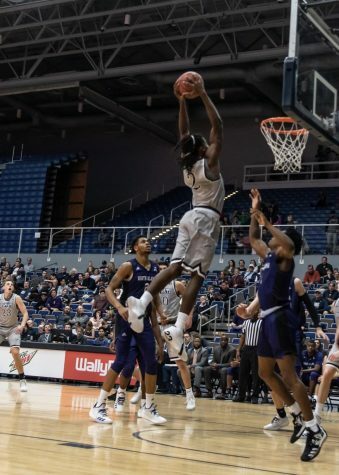 As both teams went back and forth entering the game, Junior Ezekiel Balogun jumstarted the offense as his three-pointer gave the Ospreys their first lead of the game, 11-10. Balogun recorded nine points off the bench in the first half. 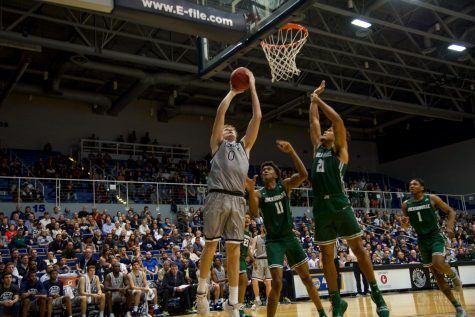 After that, the Ospreys were off to the races as they shot 60 percent from the field in the first half and Junior Noah Horchler scored 20 points, nailing nine of his 14 shots from the field. The Ospreys continued to dominate in the second half until the Lions began to chip away. 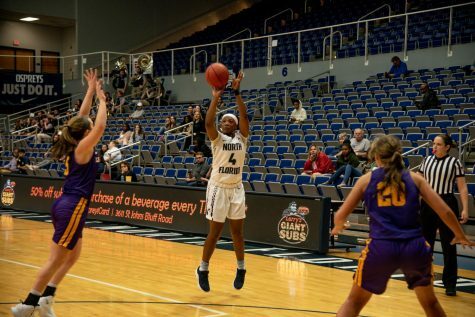 Whenever UNA threatened to get within 10 points, the shots would not hit or their defense couldn’t handle UNF’s ability to shoot from deep or expose the post. As the final buzzer sounded, the Ospreys won 82-73. Horchler scored a career-high 32 points and Balogun scored a season-high 15 points off the bench. With this win, the Ospreys are now 10-16 (4-7 ASUN) and the loss drops UNA to 8-18 (5-6 ASUN). The Ospreys travel back to Jacksonville to play Kennesaw State on Wednesday, Feb. 13 at 7 p.m.